At 96-bed Magee Rehabilitation in Philadelphia, customers are learning to love meatless options, including a meat-free version of the sandwich that bears the city’s name—a Philly Cheese Steak. To counter that, Carmine and his team decided not only to offer Meatless Monday but to offer a high-quality, healthy meatless option every day. Customers can now get meatless items such as a Buffalo tofu hoagie, hummus wraps, and a sweet potato and black bean burrito. Another daily option is the meatless Philly Cheese Steak, which substitutes seitan for beef. 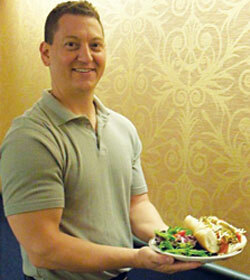 Carmine says once the department made the shift, sales for healthier, meatless options increased. Carmine is also purchasing as much local produce as possible, and he recently made the switch to cage-free eggs. Carmine has found one good source of local items: the Common Market Philadelphia, a consolidator and distributor of local foods. Carmine purchases his produce, cage-free eggs, seitan and tofu from the Common Market.